The evolution of business telecom technology is the Hosted PBX. This technology provides small, medium-sized, and enterprise organizations with a sophisticated telephone system, while minimizing equipment costs. In fact, Jive operates, maintains and upgrades your entire telephone system. A Hosted PBX from Jive lets employees work from remote offices, a hotel, or on their cell phone while remaining connected to the same office telephone system. Just like a Fortune 500 telephone system, you can transfer callers, put them on hold with music, set up conference calls or have the phone answered by an automated attendant who can direct callers to different departments. Complete with a full suite of features at a price every company will love, our Hosted PBX is the phone service designed for your business. Jive easily scales to meet the needs of any business. Whether it’s a single user at a home office or a multi-user, commercial-grade call centre, we provide a complete solution customized for your individual business needs. Our services include telephone numbers, local and long-distance calling and over 80 powerful and customizable features. The feature list provides auto-attendants, call queues, conference calling and much more. We offer companies with multiple locations the ability to operate under one umbrella. As a result, our clients and Partners enjoy increased productivity and reduced resource requirements. Due to these advances, your staff can work in regional offices, remotely, or any location globally with our easy-to-use, plug and play Hosted PBX solution. Initial Cost Savings– You do not need to make a large upfront investment by purchasing an office telephone system and there is no need to maintain it. With a Hosted PBX solution the office telephone system is operated and maintained by your provider. Ongoing Cost Savings– Typically, a Hosted PBX implementation is significantly more cost-effective over the long run than a traditional PBX. These ongoing savings are in addition to the initial savings on capital outlay. Geographical Flexibility– Employees can work from anywhere when your office phone system is virtual. You can have employees working from home, other offices, mobile phones, and even overseas. Local Presence– Hosted PBX systems allow you to get local virtual numbers in cities where you are not physically located which allows you to create a virtual presence or open a virtual office in New York or the UK. Credibility– For small businesses a virtual system can give them instant credibility by presenting their customers with a professional sounding telephone solution. Traditional telephone systems are generally cost-prohibitive for smaller organizations. Scalability– Traditional phone systems are limited by how many users they can handle as well as how many lines you have purchased from your local telephone provider. Virtual systems can expand and grow with your business as you need them to. Quick Setup– A Hosted PBX solution can have you up and running very quickly compared to a traditional telephone system. Ease of Use– End-user management of a Hosted PBX is far more user-friendly than is the case with traditional solutions. Intuitive web interfaces mean that anyone can manage, monitor and make changes to the service at any time, without needing any specialized skills or experience. For complete lists of our included and optional Hosted PBX features, see our Included Features and Optional Features pages. A customer calls your toll-free or local phone number and the call is answered either by your receptionist or an automated greeting. You can even have multiple receptionists in different geographical locations answering your incoming calls. If the receptionist is not available and an automated greeting answers the phone call, customers can choose to dial an extension, a specific department, listen to product information or use the dial-by-name directory.One of the great benefits of a Hosted PBX system is that employees can be working in different geographical locations. For instance, an employee working from home in New York can transfer a caller to technical support which is located in Toronto, Canada. Employees can answer calls from their cell phones, on a laptop, from their home or anywhere with a traditional landline or internet connection for business Voice-over-IP. Let us go over a few of the ways that a Hosted PBX can be used to replace your current telephone service or work in conjunction with it. Keep your existing landlines– You might choose to keep your existing telephone lines and have calls forwarded from the Hosted PBX service to these telephone lines. For instance when someone calls the “sales” department, the Hosted PBX service could simultaneously call Bob and Anne’s traditional telephone lines. This implementation may not be ideal as it generally means that the total cost of your phone solution is higher, because you have to pay for the Hosted PBX service and the traditional telephone lines. Use mobile telephones– Many companies have employees who are outside of the office most of the time (real estate agents for instance) and would prefer to receive their calls on their mobile telephones. Calls from the Hosted PBX service can be forwarded to your cell phone and many Hosted PBX services allow you to choose to send a caller to voicemail or transfer the call to another extension (which might be another cell phone). Use voice-over-IP– Some Hosted PBX services, such as Jive, are bundled with VoIP service. This is usually the optimal solution as it eliminates the need to have a telephone line with your local telephone carrier to make and receive calls. You can choose to use multi-line digital office telephones that plug directly into your internet connection. Typically there is also an option for using soft phones which are computer programs that simulate a business telephone on your desktop so you can make and receive calls using a USB headset. Use smartphone apps– Smartphones allow companies to better integrate mobile employees into the company’s service. Apps such as Bria for iPhone or Android are relatively new developments in the industry, and allow employees’ smartphones to behave in the same manner as desk phones in the main office. As an example, the smartphone can display the company’s caller ID when placing outgoing calls, rather than the caller ID of the smartphone itself. The use of a smartphone app also means that calls do not need to be forwarded to the smartphone; the device will inherently make and receive calls as if it was a desk phone. Smartphone apps can work well for mobile users while employees in the company’s physical office can use VoIP desk phones. The two approaches complement each other and can be easily used in conjunction. Want to learn more? Explore these links to additional information on our website. Our Hosted PBX services offer many benefits to businesses of all sizes. 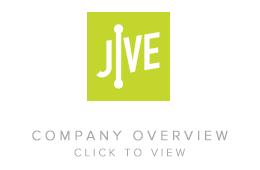 Learn what we can do for you and why you should choose Jive. Every business is unique, but we have plans and equipment for virtually every need. Find your perfect match here. Read testimonials from clients, including company names and website addresses. Here are some examples of Hosted PBX deployments.